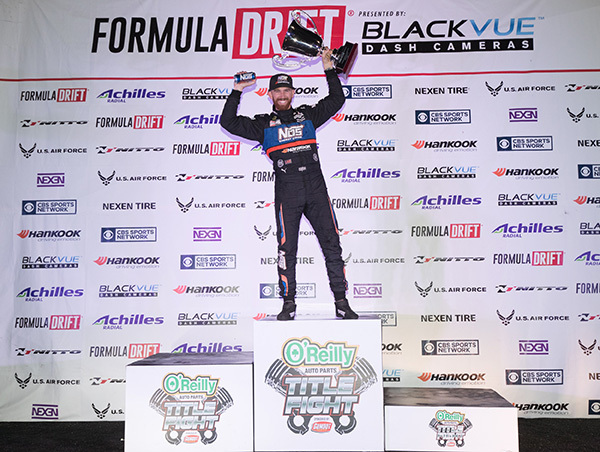 Long Beach, Calif. – October 8, 2016 – The O’Reilly Auto Parts “Title Fight” sponsored by Gumout at the Formula DRIFT Championship presented by BlackVue Dash Cameras completed the 2016 Pro Championship season in dramatic fashion with Matt Field in the Gears of War 4 / Falken / Driftcave Motorsports Nissan 240 taking the event victory, while Chris Forsberg, in the NOS Energy Drink / Hankook Nissan 370Z is crowned both the Pro Champion and World Champion. Irwindale Speedway, also known as the “House of Drift,” hosted the sold out event. Over 600,000 global viewers tuned in to watch the event unfold via the Livestream. The season culminated at the largest event of the year and with the championship at stake the drivers put it all on the line. Entering the event, only four drivers were mathematically eligible to take home the championship, 2-time champion, Chris Forsberg, returning champion Fredric Aasbo, 2010 champion, Vaughn Gittin, and Aurimas “Odi” Bakchis. As the event progressed, Gittin, had an early exit in the round of 32, which left Aasbo and Forsberg left to control their own destiny. The Top 16 saw many spoilers and upsets as Forberg crashed in his chase run against Patrick Mordaunt giving a small chance to Aasbo. In Aasbo’s Top 16 battle against Matt Field, Aasbo initiated contact on his chase lap giving the edge to Field, which ultimately cost him the decision to give Forsberg the 2016 Pro Championship. This makes Forsberg the first 3-time Formula DRIFT champion and first champion to win without winning a single round of competition. Forsberg also is awarded the 2016 Formula DRIFT World Championship. With the championship determined, the remaining drivers continued to make a statement and end their season on a high note. Ryan Tuerck faced off against Tyler McQuarrie in the Top 16 and edged out his opponent, but at the finish line had mechanical issues, which forced him out of the competition, but by qualifying in second, he secured third place. The final battle pitted number one qualifier, Dai Yoshihara and Matt Field, who won Round 7. 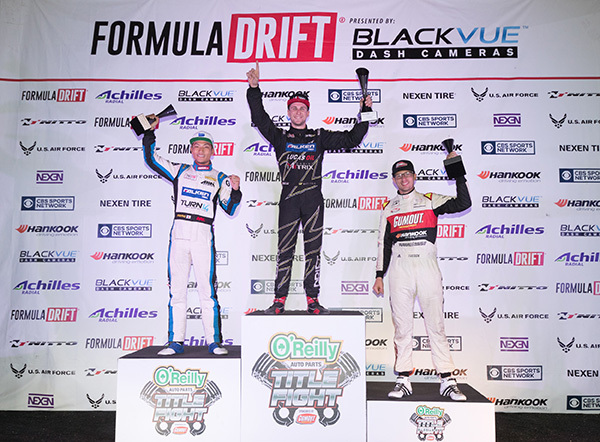 Continuing on the momentum from Texas, Field drove hard and consistent, and caught a break as Yoshihara’s power steering went out pushing him into the wall on his chase run which gave him the victory. The event was highly competitive with many battles often too close to call for the judges leading to several “one more time” calls. In the Great 8, returning champion Fredric Aasbo in the Rockstar Energy / Nexen Tire SR by Toyota tC, who entered the event second in points by only five points faced the 2-time champion and point leader, Chris Forsberg in the NOS Energy Drink / Hankook Nissan 370Z. This battle was significant for the championship chase. An over correction by Aasbo opened the door for Forsberg to enter the semi-finals. Rookie of the year honors goes to Alex Heilbrunn in the RTS Monster BMW M3, while SR by Toyota takes the Manufacturer Championship, and Falken Tire comes from behind to win the Tire Championship. For more information visit, www.formulad.com and find Formula DRIFT on Instagram @formulad, Facebook www.facebook.com/formuladrift, Twitter @FormulaD, and Snapchat – formula_drift. Tune into Formula DRIFT on CBS Sports and check your local listings for airtimes.